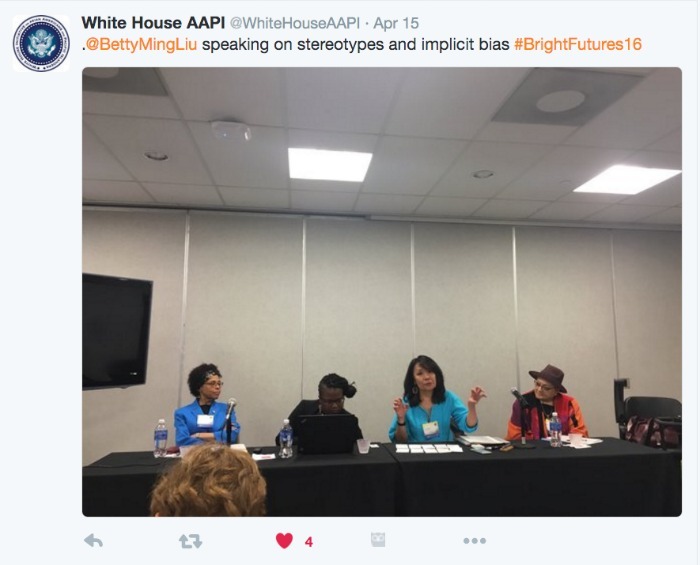 What it means to be girls of color: “Bright Futures 2016” What it means to be girls of color: "Bright Futures 2016"
I just healed by sharing personal heartbreak on race issues. The experience chiseled me out of my emotional armor, the fake-confidence that protected me from acting like a lonely, yellow outsider. Maybe I can finally chase away the sense of otherness for a healthier, more satisfying option: wholeness as an American woman of color. Miracles like this happen when people talk. Really talk. As you know, I rely on my shrink for deep conversation. But my latest transformation came through a radically different setting — South Jersey. Specifically, the Rutgers University-Camden campus, where I joined 250 like-minded women (plus a few good men). 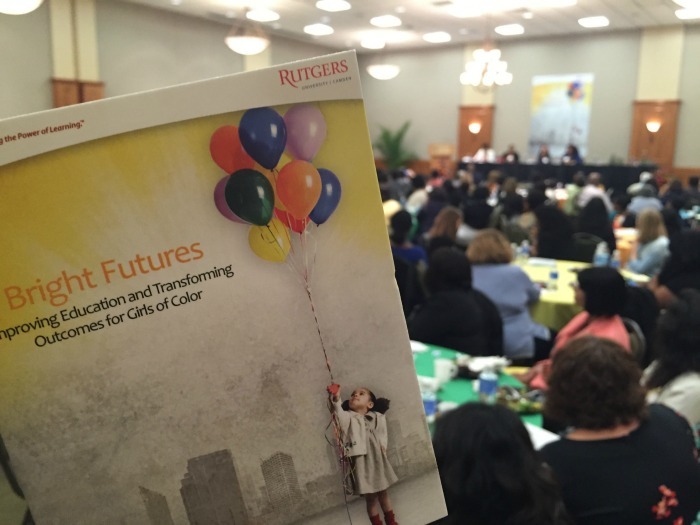 The event was the first-ever Rutgers “Bright Futures” conference (April 14-15). We converged to commune and commiserate. What a remarkable group, so diverse in skin tones, cultures and agendas. Educators, community leaders, activists, journalists and wonks under one roof. The word “historic” kept popping up as we explored a common concern: educating and saving our girls of color. Girls of color are a precious demographic. Long-suffering and long-ignored, they’re finally receiving some belated attention. February 2014 — Pres. Obama announced “My Brother’s Keeper,” a five-year program to improve the lives of struggling Black and Latino boys and young men. 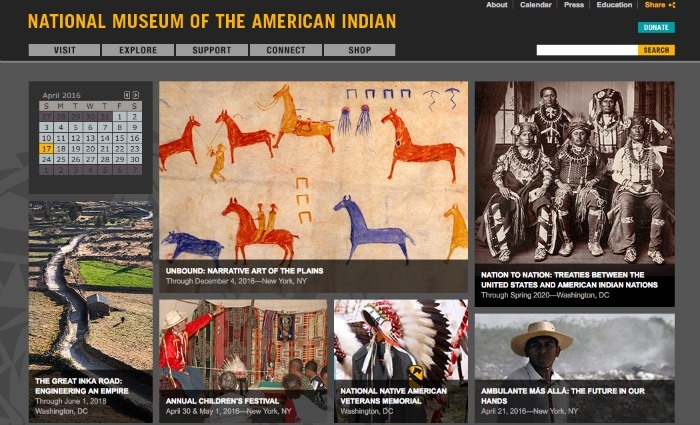 It launched with $200 million in pledges from private donors. It triggered an obvious follow-up question: What about the young women and girls? November 2015 — After two years of pressure from girl power advocates, the feds released a report on issues facing women and girls of color and announced a girls’ program. Except, minus a catchy name. And, with half the funding ($100 million in pledged donations). Now, fast forward to the “Bright Futures” conference. What impressed me most was the genuine effort to seat everyone at the table. The forum went beyond Black, Latino and White, making room for Native Americans and Asian Americans too. And yes, creating a collective matters because we all care about our kids’ futures. Everyone talked about the need to rise above the toxic divide-and-conquer mainstream American mentality. But I’m getting ahead of myself…. We opened on Thursday night, focusing on the tragic state of black girls. The speaker, YWCA’s CEO, Dara Richardson-Herons, is African American and a medical doctor. She spotlighted the awful data: 60% of girls of color come from low income families. Black female high schoolers are six times more likely to be suspended. From childhood, stereotypes mark black girls as “angry,” “loud,” and/or over-sexualized. Friday morning’s keynote speaker, “Latino USA” anchor/producer Maria Hinojosa, toured us through her community. Deportation fears. High suicide rates. Staggering drop-out rates for high schoolers. We laughed as she joked about her hectic life as a hard-working Mexican immigrant. She had me near weeping with her rousing wrap-up message: Fight the fear. Find courage to tell our stories. Be ourselves. P.S. – The last time I saw Maria, we were young(er) moms. It was nice to catch up, show off our kids’ photos, trade hugs. Friday lunch treated us to Helen Zia, the celebrated civil rights activist, author and former Ms. magazine executive editor. She talked about Asian American females logging high suicide and depression statistics, and the pressure imposed by stereotypes. Helen ripped into the Model Minority image of the “good, quiet Asian,” by sharing about her family’s domestic violence. (E.g., Her Chinese immigrant dad, angry about life in America, beat Mom and sometimes, the kids.) She cautioned against viewing AAs as honorary Whites, which pits White + Asians vs. Blacks + Latinos. Instead, she called on us to stand together. Once the Big 3 keynoters set the discussion framework, we broke out into a dozen or so panels. I was in “Stereotypes and Implicit Bias,” led by Rutgers visiting professor Lee Ann Elliott Westman. There were four of us, each with 10 minutes to talk. For a crash course on the roots of racism and bias, we had Villanova University Chief Diversity Officer Teresa Nance. She is also the associate vice provost for diversity and inclusion, and a PowerPoint ninja. Her speed lecturing is impossible to replicate. “Ethnic Notions,” a 5-minute flick, that chronicles the roots of anti-blackness in the U.S.
To test your own bias levels, take a Harvard University implicit bias test. The media’s brainwashing power was explained by Boston University Assistant Professor Sherrell McArthur. She explained the dangers of living in a society (ours) where 90% of all news outlets are controlled by six mega-companies. Among her points about education, she detailed a need to provide teachers with more diversity training; today’s kids come for so many different countries and cultures. For a look at how changing laws can change stereotypes, we heard from the legendary Native American activist and poet Suzan Shown Harjo, who heads up the Morning Star Institute. Her successes include the return of a million acres of land to Native peoples and the 1989 law which created both the National Museum of the American Indian in Manhattan’s Customs Building and a new musuem building in Washington, D.C. Her decades of legal wrangling with the Washington Redskins for a team name change continues to this day. As for me, I focused on the personal impact of everyday racism. Everyone seemed to stop and think when I wondered out loud: Why are Asian, Caribbean and Latin cuisines considered ethnic? Hmmm, but French cuisine is NOT ethnic. Who gets to decide? Studies show that immigrant families keep their girls on tight leashes. Unlike the boys, they’re often forbidden from participating in after-school activities and from having friends. Girls are also given more household chores. Multiracial Americans (like my daughter) are the fastest growing population in the country. But research shows they suffer from otherness. They feel unwelcome by their parents’ cultures. Not Black enough, not Asian or Latino enough. Let’s spare the isolation that we’ve dealt with as girls and women of color. They need to be embraced by us all. Now. “Model Minority” was coined during the Civil Rights movement by the White media. It carries the subliminal message that Asians are “good” compared to the “bad” minority — African Americans protestors. So remember, anyone who buys into the Model Minority is hating on Black folks.. Check out my blog post: “What is a microaggression?” People find it very useful. To make my points, I flipped through my home-made everyday racism signs. You speak such good English. The room went silent. Clearly, reading the words cracked open some armored memories. The signs proved effective in quickly gathering the unresolved pain of our collective stories. I could feel the energy releasing in our safe space, which was beautiful. 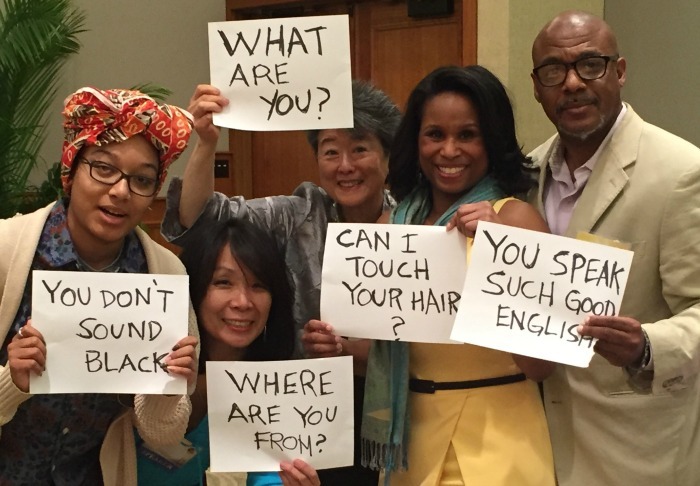 Afterwards, when a woman said she liked my everyday racism signs, I gave them to her. But during the afternoon, so many fellow attendees told me they felt acknowledged by the signs that I made a few more. This time, I thought to take pictures for you. 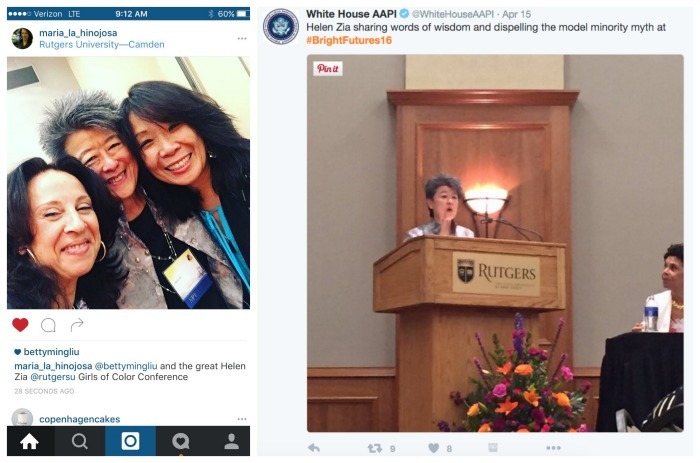 A special thanks to the White House’s AAPI folks. When one of their panelists had to cancel last-minute, Helen Zia suggested me as an alternate. Lucky me! I really enjoyed the conference. Making new friends, hearing new voices (outside of my head) and bonding with old friends made for two very refreshing days. And what a bonus to hang with Helen, who I usually see once a year (at most). At the end of a long Friday afternoon, the two of sat together through a final presentation, happily comparing notes. I stayed for the talk by White House-AAPI Executive Director Doua Thor about her organizations online data resources for AAPI research and to see if she’d say more about her Hmong heritage — one of the three dozen Asian American sub-groups that we need to hear more about. My inner girl of color felt really good. She finally found a safe place for hugs, nourishment and sharing. She can carry on now, more comfortable in her adult skin as a grown woman of color. And, what about you? Any thoughts on girls and women of color? Enroute to Camden you must have passed through Trenton. Next time, stop in for tea and cake! I’m not sure people are necessarily attracted to those most like themselves. I see a lot of basic personality differences in the couples I know – especially in the more successful ones. Of course few are as extreme as those of my husband of over 20 years and myself. He is black and an unreconstructed East Village artist type who thinks that if you have a saucepan and a mattress, you are furnished. I am white and an old-school WASP who needs china, linens and silver for at least 2 dozen, just as a start. It’s sort of like Che Guevara living with Martha Stewart. 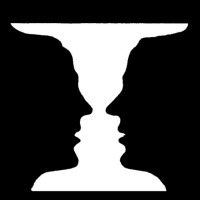 Perhaps that’s why we never argue; we take different things seriously. Of course, beneath all that superficial stuff, our values are the same, as is our taste for old Warner Bros. cartoons. That’s a cute image of you and your husband! How nice that opposite attract successfully for you. I’m not sure where I stand on this. My marriage was an opposites situation. My current relationship feels sort of opposite/similar/complementary all at the same time. We just covered a unit in my Communications class about opposites attracting. The research says that usually, people go for someone similar or complementary. It’s all very interesting. Very insightful and the signs could really take off as a needed exercise in teaching about tolerance and diversity. I have worked with people who have a variety of disabilities as co-workers and clients. The ignorant and insensitive things they endured are many. Anyone who is “other” faces this. Lately, I am growing tired of the backlash against sensitivity to this being branded as political correctness as something to rail against. I cannot understand how being kind and thoughtful to someone different than ourselves is a negative. It has become an excuse to get away with bigoted statements and acts. Thank you for highlighting the need to remain steadfast in advocating for awareness and sensitivity.